The national holiday is always a party, with people celebrating all over at the country’s parks, beaches, restaurants and bars. Here’s where to go for good vibes and a great time this Australia Day. If you really want to celebrate all things Australian, head to one of the many beaches that line the coast. But for the best experience, go to the most iconic one: Bondi. This year, the country’s most famous stretch of sand will have plenty of entertainment for the whole family. The live music, barbecues and party atmosphere will be hard to beat, plus the Havaianas Challenge — which will try and set a record for the longest line of giant inflatable thongs in the water — will keep the kids busy. Going to The Rocks is like stepping back in time, so it’s only fitting to spend Australia Day there. The cobblestoned streets will be packed with market stalls dishing up typical Aussie fare (think meat pies and bangers and mash) and souvenirs. For those with a more sophisticated palate, most of the charming restaurants and cafes around the area will be open for business, so you can drop in for a meal or a wine. If you’re going at night, don’t forget to take a stroll along the promenade to catch a glimpse of the fireworks. Looking for a family-friendly outdoors event in the nation’s capital? The all-day festivities at Commonwealth Park should do the trick. Kicking off at 7:30 a.m., the event offers something for everyone: There’s breakfast, fresh food markets, a flag raising ceremony, rides, arts and crafts and face painting. There will also be vendors serving up all kinds of food, so you can leave the packed lunch behind if you wish. Expect the kids to come back just before the fireworks with the Australian flag painted on their face, hay from the animal den on their clothes and proudly holding a new work of art. Among other things, Australia is known for its incredible fireworks displays. And Aussie Day is when the clever people behind the crackers pull out all the stops. For a fantastic view of Canberra’s fireworks, head to the shores of Lake Burley Griffin. The colour explosion starts at around 9 p.m., but get there a little earlier to save your spot, grab a bite to eat and sing along to the Aussie soundtrack (you might want to brush up on “Waltzing Matilda”). If you’ve already got plans during the day or you’d just rather spend the afternoon in the pool, this could be the perfect event for you. Starting at 8 p.m. (giving you plenty of time to dry off), the Kensington and Norwood Pool will be hosting a movie night in the great outdoors. With Million Dollar Mermaid playing on the big screen, you can enjoy gourmet goodies or your own picnic — and for just $4, you can go for a swim under the stars. Music, check. Family fun, check. Activities, check. All for a good cause — bonus! The Port Adelaide Music Festival is an Australia Day celebration that ticks all the right boxes. With all funds going towards Canteen and young people living with cancer, the Alberton Oval will host musicians like Sarah Lloyde (from The Voice) and Steve Simons. This feel-good event caters to all ages, with carnival rides, raffles and food and drink also on offer. Australia Day in Hobart means one thing: the Point to Bridge Yacht Race. For an unbeatable vantage point, head to Wrest Point’s Derwent River. Along with the best seats in the house from which to watch the race, you’ll also be treated to sizzling barbecues, outdoor bars and other family-friendly activities. If you want to spend the day outdoors but the beach is more your thing, Hobart’s “Aussie Day on the Foreshore” event could be just the ticket. Held at Gravelly Beach, the low-key yet packed event involves water activities, pumping music, fresh barbecue fare and games and prizes for the kids. Want to pay homage to Australia and start the day right? Well, the breakfast buffet down at the Eaton Foreshore will let you do both! The guys at the Lions Club will be serving up delicious, hot, cooked breakfasts for anyone with an appetite. Once you’ve satisfied your tastebuds, you can turn your attention to flag raising, train rides, jumping castles, face painting and live entertainment. You’ll want to be comfortable, so don’t forget to bring a picnic rug. For something a little different, why not ring in the public holiday with a game of tug of war? The foreshore in Perth (at the Champion Bay end) will be the site of some seriously fun games of tug-of-war, which will be hosted by the Geraldton Lions. If you’re keen on healthy competition and giving your muscles a workout, you can sign up a team of five either on or before the day. This country is basically a huge island and, as such, beaches have come to define it. Luckily, we’ve got some of the most beautiful ones in the world! To celebrate in true Aussie style, head to Darwin’s ultimate beach party. Hosted by the Turf Club, the day will be jam-packed full of things to do and see, including toad races, a bogan beauty pageant, live music, cricket matches and a barbecue lunch. All you have to do is pack the picnic blanket and place your bets! If the beaches are too busy for your liking, consider spending the day at the Territory Wildlife Park. It’s one of the country’s most exotic and interesting nature parks and for Australia Day it will be offering visitors the chance to get up close to the wildlife, watch presentations and enter raffles. There will be plenty of fun and games to keep the kids entertained, too. For a stylish and memorable day, head to Caulfield Racecourse for the Australia Day Races. Adults will be able to place bets, indulge in some bubbles and enjoy a chat while the kids can run amok with pony rides, jumping castles, slides and face painting. Best of all, these activities are free! You won’t go hungry, either, as snags and hamburgers will be served fresh off the barbecue all day long. Whether you’re a music fanatic or someone who just enjoys a tune, the Whitehorse Australia Day Concert is a great option. The free twilight concert will be held at the Whitehorse Civic Centre in Melbourne and will kick off with kids’ entertainer group The Mudcakes. The troupe will then be followed by Mahalia Barnes, The Soul Mates and Achtung Baby before the night finishes off with a bang: a fireworks display. 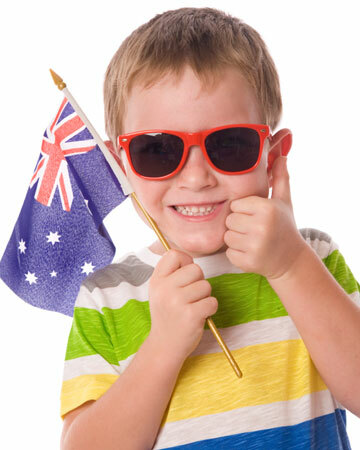 This year, the parklands on the south bank of Brisbane will once again be home to the city’s Australia Day Festival. Along with watching a traditional flag-raising ceremony and military salute, guests will enjoy live performances by chart-toppers Evermore and indie group Art of Sleeping. Of course, no Aussie Day celebration is complete without fireworks and this one will be no different. Suttons Beach in Redcliffe is set to be another hot spot on Jan. 26. Food-wise, seafood and cold beers will be the highlights on the menu (which explains the name of the event). The beach will also be the site for a DJ and dance arena, sand games, mud crab races, amusement rides, water activities and — get this — an ice cream eating competition. A cash incentive to eat ice cream? Sign us up!